Ten years ago, Stephen made an impromptu suggestion that a bunch of his friends gather at his place to play board games and drink Guinness to celebrate St. Patrick's Day. 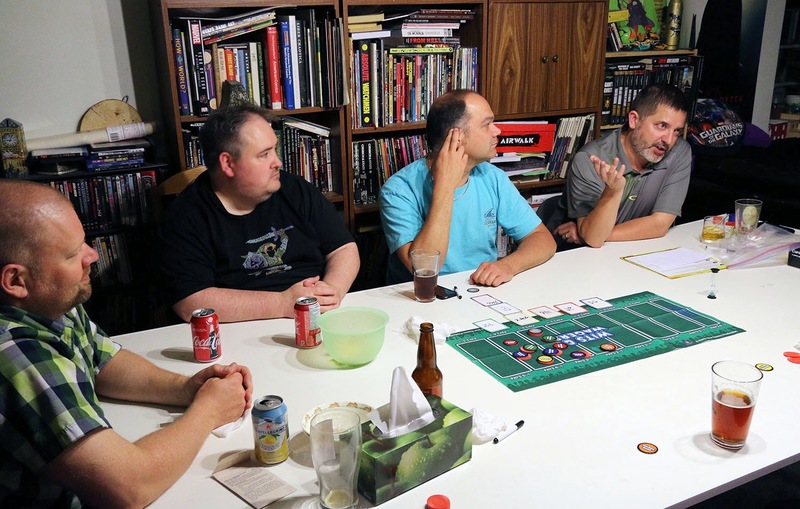 That event went over so well that it's become an annual tradition, hosted by each of the gang's members in turn, introducing our own branded promotional items and customized board game accessories as the years have gone by. 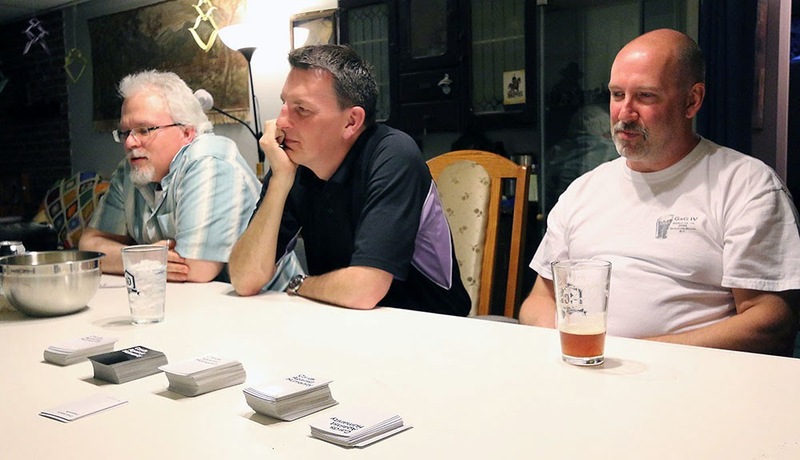 For example, Mike Parlow (right), created his own Gaming & Guinness Anniversary Edition of Wits & Wagers, featuring trivia from across G&Gs I-IX. To celebrate the 10th anniversary, we reconvened at founder Steve's this year. The first night of any G&G event is typically pretty casual, as out-of-town guests may not have arrived yet and others are just leaving work. 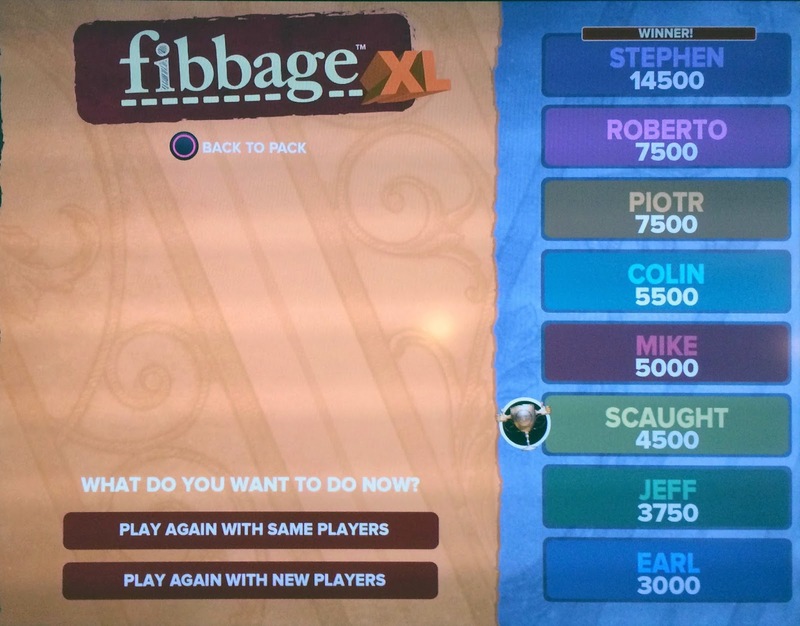 Casual games, then, are the order of the day, and we started things off with some of Steve's amusing PlayStation contests, such as Fribbage XL, above, and Drawful. Try drawing on a tiny iPhone screen and you'll imagine how well I did at that. 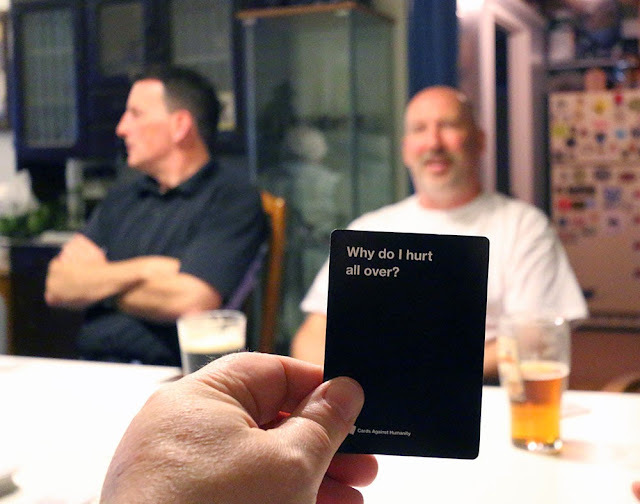 Cards Against Humanity (above) and Pimp are casual card games best suited for audiences with a sick sense of humour, so much so that even mentioning them probably means I'll never run for office. (Again, that is.) I don't remember who won these games, although in a sense you could argue that humanity lost. Having Colin (far left) back for the first time since the original G&G was a highlight this year, and I'm glad he could make it, even if it did result in massive carnage at the chariot race...but that's for day four. Labels: Board Games, Colin, Games, Gaming and Guinness, Jeff P., Mike P, Mike T, Pete, Rob D, Scott F., Stephen F.